The weather has been just about perfect for tomatoes this year. I'm still picking three or four a day. I never get tired of toasted bacon and tomatoes sandwiches. 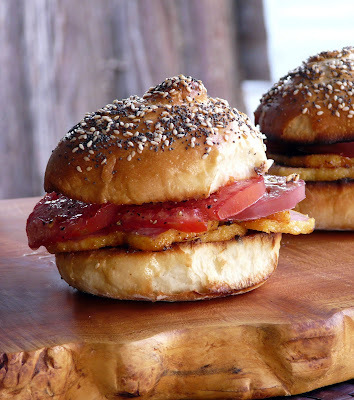 Breakfast this morning was another one but this time I used Canadian Back Bacon and homemade buns. My Ole Sweetie-Pi would be positively MAD for this. I must not tell him of this, LOL But I will. 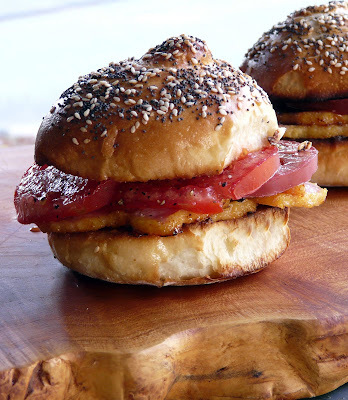 Bacon and tomatoes make the perfect sandwich, especially in a homemade bun. A yummy way to start the day. Ann, such fine ingredients on your delicious homemade rolls ~ I would be soo happy with that; any time of day!